After visiting San Giovanni Crisostomo, take a brief detour down Calle della Stua, a small alley at the far end of Campo San Giovanni, to the left; at the end, on the Grand Canal, is the little Campiello del Remer, with a palace adorned by some fine Byzantine capitals and arches, plus a view across the water to the Palazzo dei Camerlenghi (Venice’s Treasury). Returning to Campo S. Giovanni, Calle dell’Uffizio della Seda (behind the church, at No. 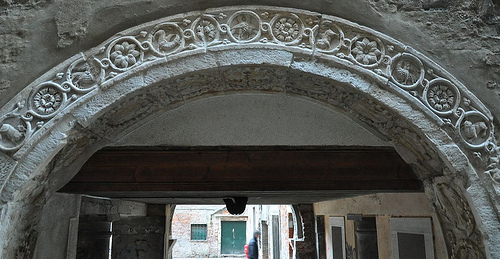 5864) was once the headquarters of Venice's silk workers and merchants. Many were exiles from Lucca in Tuscany, which in the Middle Ages produced silks that rivalled Byzantium's finest. Their skills, combined with raw silks imported from Syria, Turkey and Persia, strict laws passed in the 1450s forbidding the use of inferior thread or dyes would make Venice a major manufacturer of luxury silk in the Renaissance. By 1600 the city had 2000 workshops, the ancestors of today's Fortuny. From here, Calle del Teatro leads around to the Teatro Malibran; nearby is the entrance to the Corte dei Milion, once the home of Marco Polo's family.